Aar Koto Raat Eka Thakbo Lyrics From Bengali Movie Chokher Aloye. 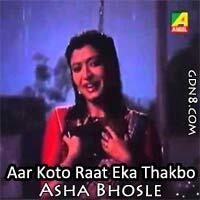 This Song Sung By Asha Bhosle. Featuring By Debasree Roy, Tapas Pal And Prosenjit Chatterjee. স্বপ্নের রঙ্গে ছবি আঁকবো ও..
কি করে আঁচল দিয়ে ঢাকবো ও..
আর কত রাত একা থাকবো..
Swapner ronge chobi ankbo o..
Nijeke shoriye ami rakhbo o..